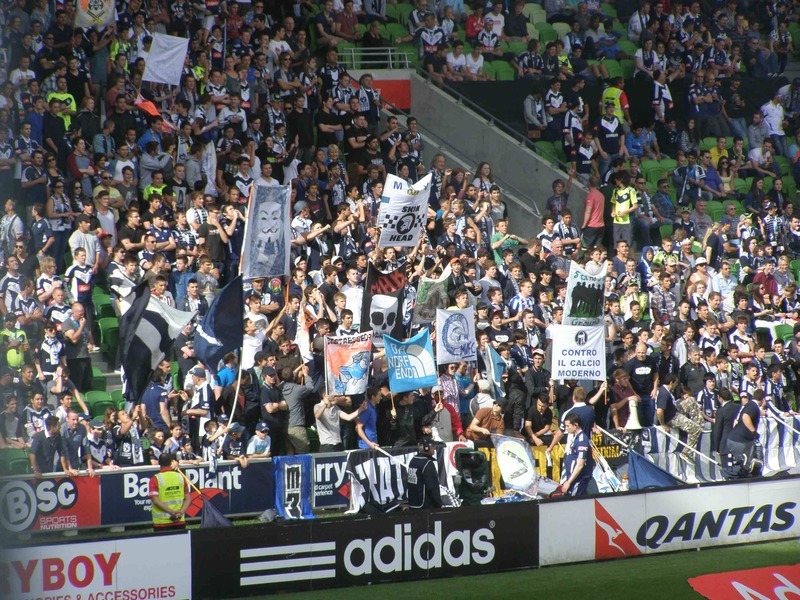 Melbourne Victory could not erase the memory of the five-nil hammering in the second round of the A-League at AAMI Park on Saturday night as it struggled to a one-all draw with a very impressive Brisbane Roar. The game was played at a high tempo throughout and had plenty of quality efforts by both sides. Victory started strongly, dominating the opening half-hour but could not find a way to convert pressure into goals. Victory brought in youngster Nicholas Ansell for his first A-League game with Andrew Nabbout dropping to the bench. Ansell slotted into defence alongside skipper Adrian Leijer allowing Adama Traore to exploit his pace down the left flank. Socceroos Archie Thompson, Mark Milligan and Richard Garcia returned and started. Roar coach Rado Vidosic had skipper Matt Smith and Ivan Franjic back from their spell with the national team in Hong Kong. 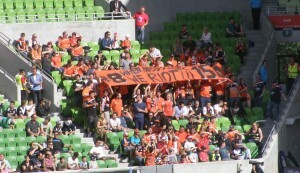 Roar brought a good support, local and travellers. A high quality first half was punctuated by a series of free kicks. Most of these were warranted and went against Victory, but the home fans were not amused. Archie Thompson got away from the Roar defence in the 19th minute and sent a cross into the path of Marco Rojas who struck it firmly and sweetly bringing a brilliant save from Michael Theo, the former Victory keeper. Brisbane opened the scoring following a free kick in the 24th minute. 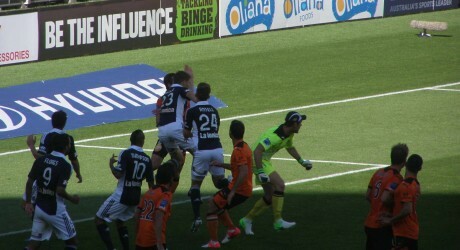 The ball was half-cleared but headed back in by Besart Berisha and Thomas Broich across the Victory penalty area. No Victory defender could make contact to get the ball away and Ben Halloran pounced to fire past Nathan Coe. It is was sloppy and untypical of the Victory defending which had been quite sound to that point. Victory came out looking for an equaliser in the second half and got it after only four minutes. Mark Milligan ran at the defence and played a one-two win Marcos Flores. Milligan picked up the return and thundered it into the far corner. Even the brilliant Michael Theo could do nothing about that shot. The keeper was immense bringing off a string of first-class saves from Guilherme Finkler, Thompson, Andrew Nabbout and Marco Rojas. 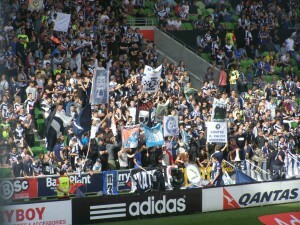 Victory fans with banners. They kept up their involvement to the end. For long spells, particularly in the second half, the Roar dominated possession, taking the sting out of Victory by forcing them to chase the ball all over the park. Also the visitors pressed high up the field and had four and sometimes five men in attack, whereas Victory relied on rebounding breaks which often foundered for lack of options as they got near goal. Ange Postecoglou thought that Victory still lacks depth at the moment though the youngsters who have come in have contributed well. When asked if he thought fourth position was acceptable at this stage given the shaky Victory start, he characteristically put it bluntly. ‘I won’t accept anything less than winning the whole thing.’ When I asked him about the Roar having four and five players in attack, while Victory was rebounding with only two or three at most, he replied that he was not looking at numbers but more getting the Victory’s structure right and dealing with its defensive frailties. Rado Vidosic was a happier man than on his last visit to Melbourne when Heart took the Roar apart. ‘Today the first goal was crucial. We survived the first 15-20 minutes, then after we scored we controlled the game. In the second half, both teams gave too many balls away.’ Both the new Asian players Dong-Hyun Do and Yuji Takahashi came on late in the game for the Roar, while Victory eventually called on Nabbout and the youngster had a couple of shots near the end. Yet the Roar mixed up their close interpassing game with a sensitive use of through balls to Besart Berisha and Mitch Nicholls, both of whom left the field after incurring injuries in the second half. Berisha and Adrian Leijer indulged in a spot of amateur night at the wrestling and the striker seemed to fall on his shoulder which left him in serious pain. He went off soon afterwards. Nicholls twisted himself badly but is not expected to miss a game as a result. All in all this was a fair outcome for an excellent, entertaining game, but the Roar probably were happier with the result than Victory. 39. Nathan COE, 3. Adama TRAORE, 5. Mark MILLIGAN, 7. Gui FINKLER, 9. Marcos FLORES (26. Andrew NABBOUT 70’), 10. Archie THOMPSON (8. Jonathan BRU 89’), 11. Marco ROJAS, 13. Diogo FERREIRA, 14. Billy CELESKI (6. Leigh BROXHAM 46’), 23. Adrian LEIJER, 24. Nicholas ANSELL. 1. Michael Theo, 2. Matt Smith, 3. Shane Stefanutto, 5. Ivan Franjic, 6. Erik Paartalu, 7. Besart Berisha (10. Henrique 58’), 8. Massimo Murdocca, 11. Ben Halloran, 17. Mitch Nichols 16. Do Dong-Hyun 73’), 19. Jack Hingert (13. Yuji Takahashi 89’), 22. Thomas Broich.